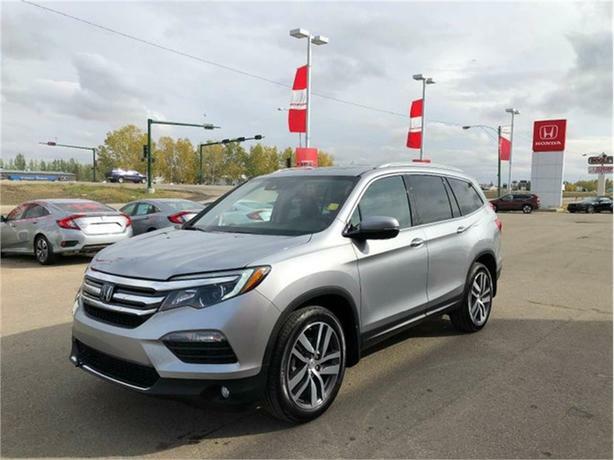 Our 2016 Honda Pilot Touring has been well taken care of. The "Alabaster Silver" exterior is in excellent condition paired with an odor free black leather interior. The Touring trim level gives you all those must have features that will leave you feeling like you are driving something twice its value. The trusted 3.5L VTEC V6 engine packs a healthy punch while still rewarding you with 9.4L/100KM. Not bad for a 7-passenger SUV. This Pilot has been regularly serviced and maintained. For your peace of mind, our certified technicians performed an extensive multi-point, comprehensive used vehicle inspection on this vehicle. At this time other than a (B) service which is part of Honda Scheduled maintenance, nothing more was needed to ensure this quality AWD is in optimal driving condition and more than ready for its next proud owners! The (B) service includes: Oil & filter change, Comprehensive front & rear brake service, Tire rotation, inspection & pressure adjustment, check for: All fluid levels, Condition of fluid, Leaks and Expiration date for Tire Repair Kit (if equipped). Full inspections of: Parking brake adjustment, Tie rod ends, Steering gear box & boots, Suspension components, Driveshaft boots, Brake hoses & lines (including ABS), Exhaust system and Fuel lines & connections.